It’s difficult to know exactly when you’re going to come across a new relative or a bit of ancient family history, but if you’ve got an iPhone or iPod touch in your pocket, Leister Productions may have just made it easier for you to capture that information and put it in a useful place. Family Matters: While Reunion for iPhone is small enough to fit in your pocket, it’s big enough to let you create, edit, and update all of your family file information. 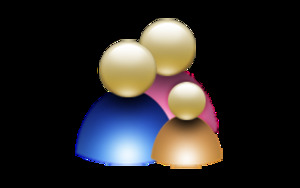 Reunion for iPhone is a companion product to Leister Production’s desktop genealogy application Reunion ( ). But by companion, I don’t mean a program with a limited feature-set or some barely useable semblance of the full desktop version. Reunion for iPhone offers many of the features available in the desktop program, the same ease of entering and editing data, and navigating your family file. 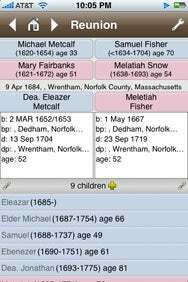 The program also includes great documentation, and, even in the limited screen space of the iPhone, offers you the option to display and navigate a full genealogical chart of your family. Also, once you make changes to the family file on your iPhone, you can then sync those changes with Reunion on your Mac. Reunion offers two ways to navigate the program’s features. First, and initially the easiest, is the settings screen, which you open using a wrench button that appears at the upper right-hand corner of the application. Once opened, there are 13 buttons giving you quick access to all the program’s major features, such as an index of all the genealogical entries you’ve made, bookmarks to specific individuals, source information, an age chart for all your relatives, and a find tool for locating your relatives by name. The second way to navigate Reunion is using “gestures,” a quick, customizable collection of ways you can swipe your fingers across the screen to quickly jump from one feature to another. Swipe your finger to the upper left-hand corner and you’ll see your family tree, swipe down and you’ll go to the Home screen, swipe up and you’ll jump to the index. I found gesture navigation to be easy and useful once I learned what gestures accessed which features. The Gang’s All Here: Reunion’s setting screen makes it easy to find and use all of the app’s features. There a few things about Reunion that I’d like to see enhanced. First, there’s no way to add a picture to reunion using the iPhone’s built-in camera. Granted, it’s not a Nikon, but using it in a pinch for adding photos would be a great feature. Second, the Reunion app’s search feature works in an unexpected way. When I tried to search for a family member only using a first name, Reunion couldn’t find them. Reunion was expecting me to enter a last name, then a comma, and a first name. To find them I needed to leave a blank space, type a comma, a space, and then the person’s first name. Finally, the program’s sync feature isn’t a true file synchronization. While data from your iPhone is synced back to the database on your desktop, if you’ve made changes to the desktop data and accidentally sync it back to your iPhone, any changes you’ve made on your iPhone will be lost. It would be great if Reunion used sync services to truly sync the data between the two programs. The Reunion app for iPhone and iPod touch is a welcome addition to the Reunion family. The program offers a great set of features and makes it easy to collect family information when it’s not convenient to use a Mac running the full version of the program. Reunion is compatible with any iPhone or iPod touch running the iPhone 2.2 software update.